Getting paid after completing a job can be both the best and worst part of being self employed – the first big cheque you get in will be incredibly motivating, but the time you spend chasing clients for later payments will be very frustrating, and having a client go bust or refuse to pay at all could ruin our cash flow. I’ve put together some tips so that hopefully this will never happen to you. Got some tips of your own? let me know in the comments section! It’s very easy to get carried away at the start of a project with a new client, and be eager to impress and show off your creative talent that you agree to start work before letting them know your payments terms. 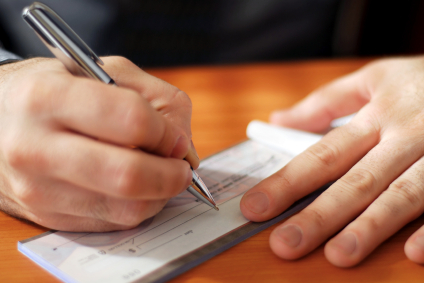 Always make sure you agree in writing your payment terms before agreeing to start work. This could either be as part of your standard terms and conditions or via something as simple as an email exchange. Personally I ask for 50% payment up front as a deposition and 50% before the final work is handed over on all projects under £2000. For larger projects this can be broken down further to payments of 25%/25%/50% or even four payments of 25%. You may be worried about asking for such a large payment up front, but if a client isn’t willing to pay up front it’s a good sign that they may be having cash flow problems themselves. If you’re planning on using terms of anything less than 30 days on your invoices it is best to be clear about these up front too. Using task based milestones also helps as the client will associate the payment with the work being completed rather than as spreading the payment over the duration of the project. It will also incentivise you to get the work done on time! Finally, if you’re in the UK and VAT registered – make sure you make sure you are clear on your quotes weather your prices are inclusive or exclusive of VAT. 2. Make sure your invoice contains all required information. It’s important that your invoice have all your company information on them as well as payment details, and the clients information. Ensure that you are using the correct client company name and address, and that your figures and dates are accurate. It’s embarrassing to have to re-issue and invoice if you get something wrong, and if the client spots a mistake they may use it as a reason to delay payment. Your full company name (and logo). The invoice number (This should be unique to each invoice, and preferable sequential). Your company number (if applicable). Your client’s company name or name. An itemised list of the services you have provided (see point 5). The invoice due date (see point 3). Your payment details (see point 4). A detachable payment advice slip. An breakdown of the VAT which has been added to each item on your invoice, and the rate at which this has been charged. 3. Make the due date more prominent. Make sure that the Due date on your invoice is clearly visible, and more prominent than the rest of the text on the invoice. This will ensure your client knows when to pay and makes it harder for them to make excuses about forgetting or not knowing the invoice was due. If they’re organised they will be entering this information into their accounting systems, which may mean they are less likely to pay early, but will ensure that you get payment before the invoice goes overdue. 4. Include your payments details – all of them. Be as flexible as you can with payment methods, and include all your details. My preference is for payment via bank transfer as this is fast, and easily auditable, however some clients (usually larger businesses, charities and government departments) prefer to pay by cheque. So make sure that you include your bank details, a postal address and the name or company which cheques should be made paypable to. You might want to also consider accepting PayPal if you are selling services or products to smaller companies, individuals or trading internationally. If you are doing repeat business or selling subscription or one-off services via a website it may also be worth setting up an internet merchant account and payment gateway to enable you to accept payments by credit card – however keep in mind that it will typically cost you around 3-5% of the transaction value plus a monthly fee to receive payment this way if you are processing low volumes. Giving vague descriptions of the services you have provided will make it easy for the client to query the invoice and delay payment, whereas providing a detailed breakdown of the work carried out will remind the client and anyone within their organisation exactly what is being invoiced for. It’s also a requirement if you are charging VAT. 6. Email a copy to your client. Posting invoices will take time, and will allow the client to make excuses about not receiving the invoice or misplacing it. Make sure that you email a copy of the invoice to the client as soon as the invoice is produced. Sending a copy of the invoice by both email and post is the ideal solution, as the client will hopefully have already read and verified your invoice when they receive your email, and the copy in the post will act as a reminder to pay. It also makes it much harder for them to try and wriggle out of paying. After you have complete a few jobs for a client you get an idea of how long they take to pay and if they need reminding. For those clients who pay quickly or consistently a few days before the invoice goes overdue I usually won’t bother posting a copy, as there is a time and cost associated with this. One piece of information to include on your invoices which I didn’t mention earlier is a simply thank you. This should be along the lines of ‘Thank you for you custom, if you have any questions please contact (You) on (Your phone number). This way if there are any queries relating to the work carried out or payment details the person processing the invoice can quickly contact you – it may not always be your contact within the organisation who deals with the accounting. Always send reminds when an invoice goes overdue, or even leading up to the due date. Make sure the reminders are written in a friendly tone and remain professional. Rather than asking for the client to pay the invoice, try asking for an anticipated payment date or ask if there is anything you can do to help such as set up a payment plan to help with their cash flow. I would recommend sending a reminder three days before the due date if no payment has been received, the day after the due date and then once per week after that. Follow up and reminders for overdue invoices with a polite phone call to check that the client is happy with the services provided and has received the invoice. Clients who consistently pay late can be infuriating, however getting angry or making threats rarely helps. It may get them to settle their invoice, but will guarantee you lose out on any future work from them. Becoming personal with lines such as ‘I need payment so I can ‘feed my family’/’pay the rent’/’pay my tax bill’ are also a big mistake. 10. Thank your client again. Always let the client know once you have received payment and thank them again for their business. I also use this an opportunity to ask if they have any other work they would like quoting, or suggest additional work which could be carried out to extend or compliment the original project. This list is by no means comprehensive – if you think I’ve missed anything or disagree let me know in the comments!